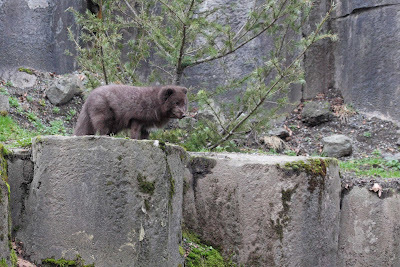 Over the last few weeks, the keepers working in Northern Trail have begun introducing our two arctic foxes, Feliks and Somer, to a larger exhibit space—the mountain goat exhibit, where one goat, CK, currently resides. Both foxes are doing very well in their new exhibit space. With the expanded room and new surroundings, they have become much more active, and guests are enjoying the new dynamic in the Northern Trail. When we first introduced the foxes into the space with the mountain goat, the goat was not sure about having these new neighbors in her area. CK showed signs of submissiveness like she would to a male mountain goat, which is interesting since she is not a submissive animal! She would go up on the rocks and stay where she could keep an eye on them as the female fox, Somer, has more interest in CK than the male, more of a curiosity than anything else. But within a week, the three of them started moving around the exhibit and laying next to each other! To our knowledge, this combination of animals has not been done before in a zoo, so we are very pleased with the results. If you haven’t been to the Northern Trail biome of the zoo in a while, now is a good time to visit and look for this new dynamic that is progressing every day. We’d love to hear what behaviors you see and any photos you can share. I love the arctic foxes and can't wait to see them in their new environment! Arctic foxes are so cute! Somer and Felixs are so much fun to watch when it is time to eat. I can't wait to see them in the bigger space. Does anyone know why this arctic fox is brown year round rather than white like a typical arctic fox? There are two morphs of arctic fox. 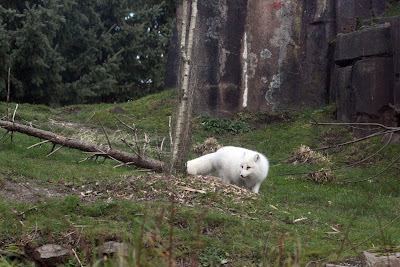 The white morph is the arctic fox most people are familiar with, which gets brown/gray in the summer but has a white coat in the winter. The blue morph is the other type of arctic fox, which has a brown/gray coat that lightens in the winter but never becomes truly white. 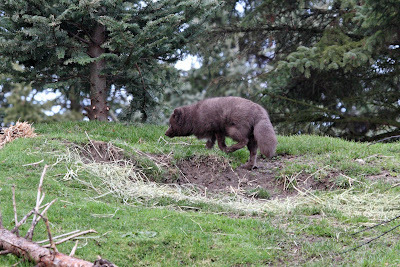 At our zoo, the male arctic fox, Felixs, is a blue morph so that's why he appears brown year round.